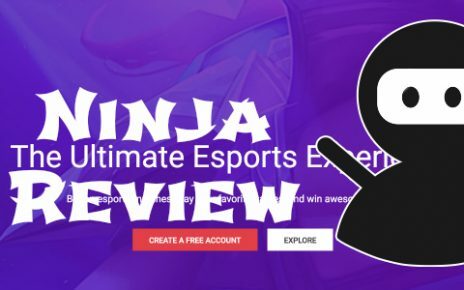 With a modern design and slick interface, this site certainly knows how to appeal to the E-sport gamer crowd. With an eye-catching and easy to use navigation system, it is easy to find the section for your favorite esports. However, this is where its contemporary design ends. When navigating the page, some elements are slow to load and sometimes unresponsive, parts of the design feel rushed, detracting from its aesthetic. On the plus side, the platform is clearly separated into live and upcoming events and offers more than ten different esports titles to bet on, each clearly separated with their own tab. Certain sections of the website appear to suffer from lag, particularly the opencase section, whereas the streams did not stutter, indicating a server issue. 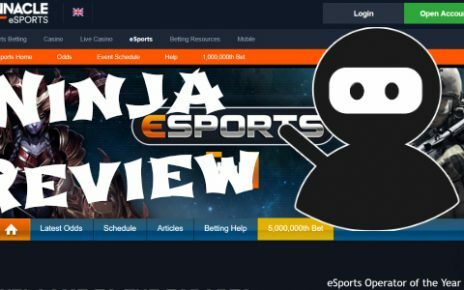 The service doesn’t have much of a reputation, being new to the esports betting industry the bookie is yet to build up much of a review base. In our experience, we have found the website to be well managed and responsive for the most part. The brand is owned by Galaxy 88 LTD, a registered company in the UK, though we were unable to determine if the company has a betting license due to the limited information available. The sportsbook has a fairly simple range of betting options. With both live streamed twitch events, and upcoming matches available to bet on. The feature set of the website is standard, with few standout features to separate it from other similar services. The platform does publish a basic breakdown of how betting works for the major titles, including League of Legends, DOTA 2 and Starcraft 2, but not all available titles are covered. Esporbet does, however, have a case store, where you can buy various cases, though the FAQ section explaining the workings of this store is still under construction. The page is currently available in six languages, including English, Turkish and Spanish. Of the other platforms we compared it to, Esporbet had very similar odds and didn’t appear to have the best odds overall. The odds are, however, fair, and not disproportionality uneven. On average, playing here will not offer any major advantage in terms of odds, but may offer matches not present on other bookies, particularly those for the smaller titles including Clash Royale and World of Tanks, which are often not covered by other esports betting sites. Esporbet is currently running a 25% first deposit bonus using the code “ESPOR1”. There are several other criteria to fill before you are able to withdraw the bonus balance, including making a bet on 1.30 stakes or higher with your main deposit, as well as betting the bonus in 2.0 stakes or higher ten times. The maximum bonus you can get using this code is 250 EUR/USD. Esporbet also runs a number of other deposit bonuses with similar conditions, overall, these bonuses will give a little extra when starting out but are quite difficult to cash out, making them less appealing than they first appear. 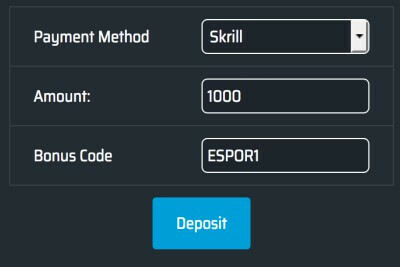 Good news, Esporbet has a large number of deposit methods, covering all the major bases. Visa, Mastercard, Skrill, Neteller and many others…. Including bitcoin of course! They even accept some lesser known deposit methods include Qiwi wallet, Yandex, and Paysafe cards. Overall, there’s a good selection of deposit methods, though we had hoped to see Paypal as one of the available options. Esporbet has several different customer service options, including both email and live chat support. In our testing, we were issued with a live chat agent within 5 minutes, and the average response time was around 3-4 minutes between questions. To reach email support, you usually need to go through the live chat first, however, their direct email address is support@esporbet.com. Live chat is only available in the Turkish language, whilst email support is English/Turkish. Overall, the website has great support and quick response times. Telephone support is also if your matter is particularly urgent. If you are gambling on a mobile device, particularly a device with a small screen, you might want to give Esporbet a pass. The page doesn’t have its own dedicated mobile version, and the full version is much too cramped to be comfortably used on mobile. If you tend to use a larger device, such as a tablet or iPad, then the site is perfectly fine, but not ideal. 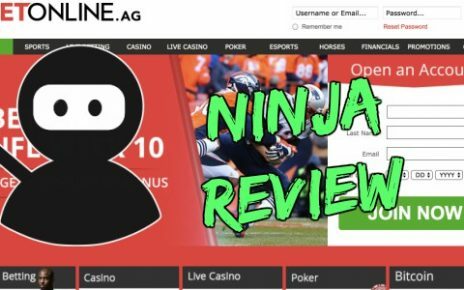 With parts of the platform still under construction, and no real standout features, this website would get a C if it were an exam, it has all the typical features you would expect from a sportsbook, but the execution could do with some work. The user interface is well designed and easy to navigate, though perhaps its only differentiating feature ‘opencase’ suffers from performance issues and is incomplete, whilst the rest of the website has frequent mistakes, which quite frankly make the sportsbook seem amateurish. If you are looking for a place with a simple, no-frills interface that delivers fair odds, this is the platform for you. The standout feature of the service is its prompt customer support.